New Mexico is one of the most underrated states in the USA. It is one of only a few states that has a true distinguishing identity. From the food to the architecture, there is a uniqueness to New Mexico that many other states simply lack. 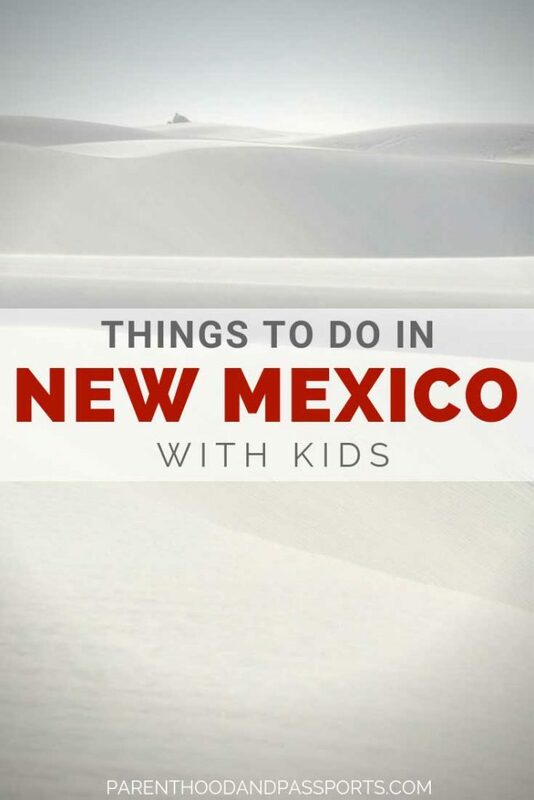 And for those visiting New Mexico with kids, you’ll find no shortage of interesting things to do. New Mexico is known as the Land of Enchantment. If you are looking for a cultural experience in the United States, New Mexico is where you will find it. The state has a rich Native American history that has influenced almost every aspect of the state. The Pueblo Indians were the original settlers of New Mexico, long before it was state and before the USA was even a country. Then came Spanish explorers who settled in New Mexico in the 16th century. They brought their own culture, food, and way of life. Although it probably wasn’t a popular union at the time, these two cultural influences have shaped New Mexico into what it is today. The fusion of these two cultures is very apparent in the state’s traditional cuisine. New Mexico is known for a very unique type of Latin-style food prepared with hatch green chile peppers. If you happen to find it on the menu, order enchiladas “Christmas style”. They are served stacked, not rolled, and are smothered in red sauce on one side of the plate and green sauce on the other side. Indian squaw bread, also known as fry bread, is also a popular food choice that is somewhat specific to New Mexico. The Native American history hasn’t just inspired the delicious food, the architecture and decor you will find in many parts of New Mexico is also different from what you may find elsewhere. 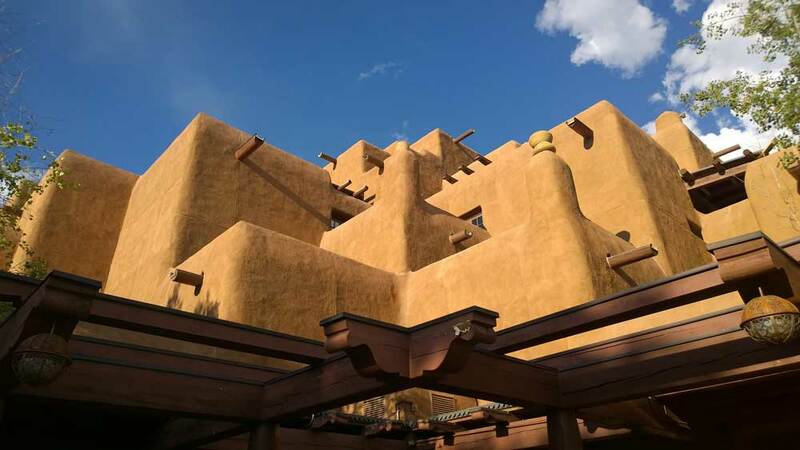 Adobe, or mud brick, is a common building material found throughout the southwest and especially in New Mexico. 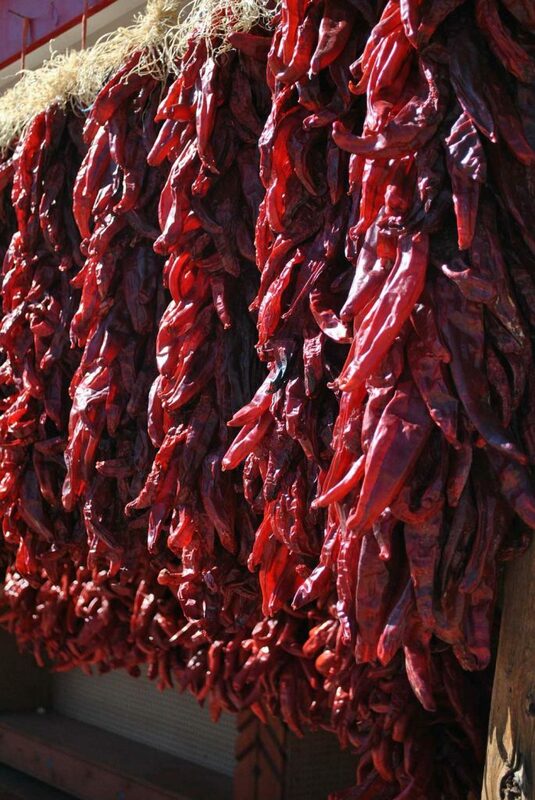 Hanging on the outside of many of the adobe buildings, whether homes or storefronts, you’ll commonly see chile ristras. I’m not sure how these strands of large dried chiles became so popular in New Mexico, but they are practically synonymous with the state. 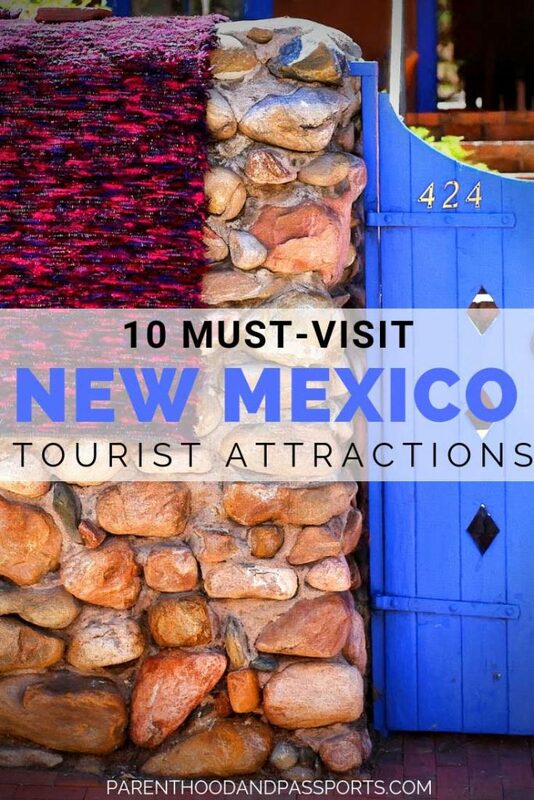 Although the architecture and cuisine are quite unique, there are a lot of things to do in New Mexico besides eating delicious, authentic food and looking at cool buildings. 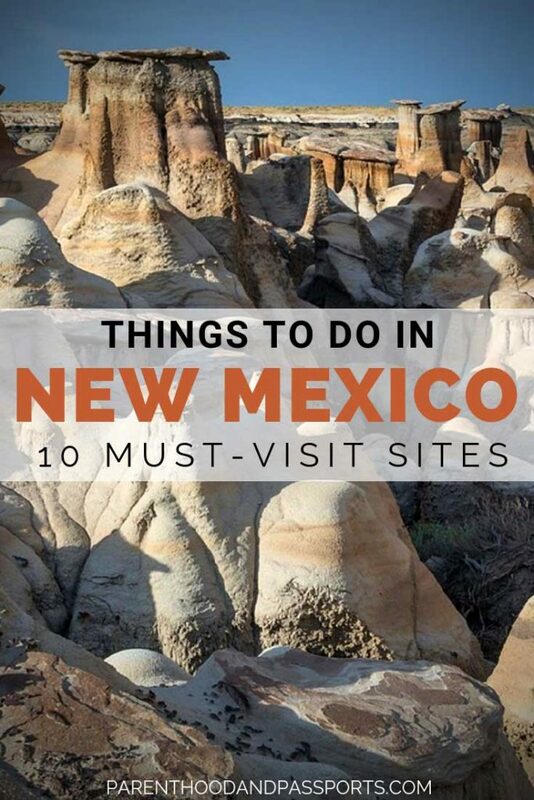 Those visiting New Mexico with kids will enjoy exploring the varying landscapes across the state. From mountains to deserts, to caves, and sand dunes, New Mexico has a little bit of everything. If the Sahara desert and the beaches of the Bahamas had a love child, it would be White Sands National Monument. Imagine white sand stretching for miles forming gentle, rolling dunes. The national monument is beautiful and picturesque, comprised of gypsum crystals, and is the largest field of sand dunes of its kind on earth. Although somewhat remote, there are plenty of things to do in and around White Sands National Monument. I recommend packing a picnic lunch and bringing a sled. Adults and kids alike will have a blast sledding down the hills of pristine white sand. 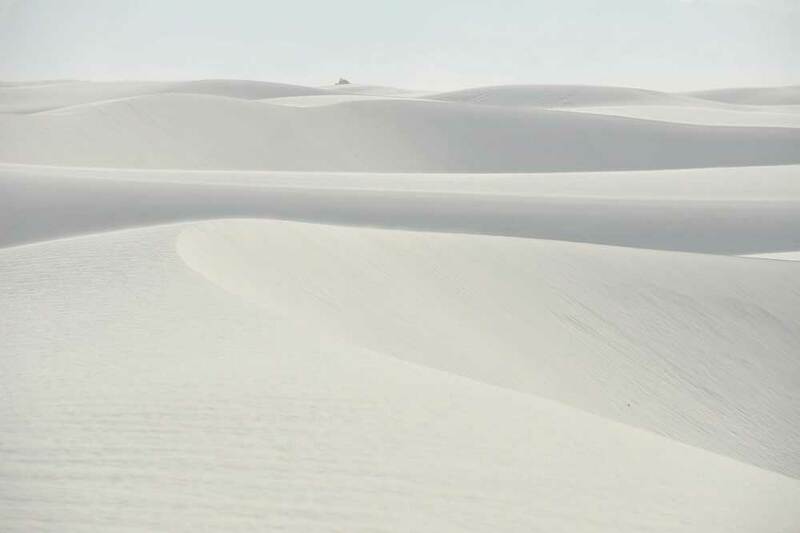 Unlike normal sand, the gypsum sand that makes up White Sands National Monument never gets hot, so you can walk on it barefooted even in the heat of the New Mexico summer. Bring plenty of water and sunscreen though. In summer, temperatures here often reach highs around 100 degrees Fahrenheit. 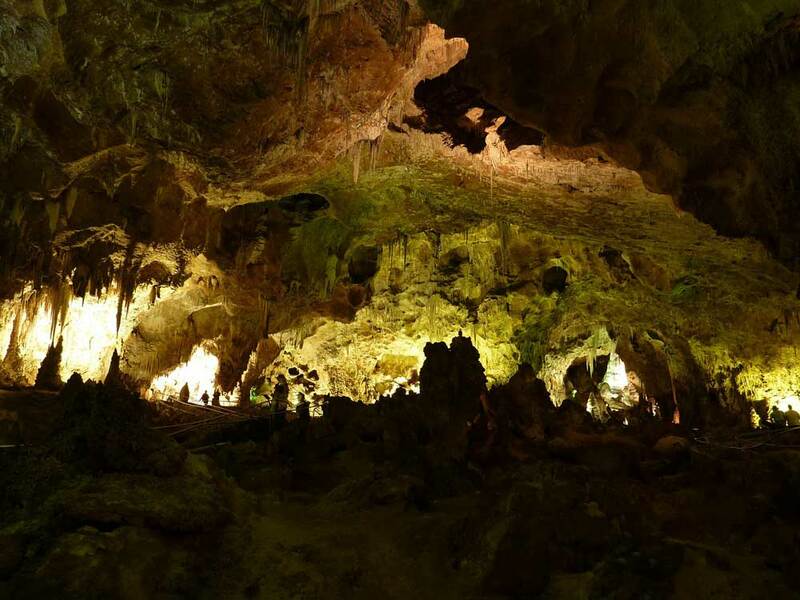 When it comes to caves, Carlsbad Caverns may be the most impressive and beautiful system of underground caverns in North America. In my opinion, it is one of the top natural wonders in the United States. It was discovered in the late 1800s and named a national park in 1930. Today, more than 400,000 people visit the caverns each year. There are several named rooms in the cave system that visitors can explore. One of the most popular is known as The Hall of the Giants or Big Room. It is the largest chamber inside Carlsbad Caverns. The caves are not only beautiful and mysterious but are fascinating to tour. Stay until sunset and you’ll get to watch hundreds of thousands of bats emerge from the cave’s natural entrance and spiral into the night sky. Fun fact, I actually lived in Roswell for more than a decade. Known by conspiracy theorists as the town where the aliens landed in 1947, Roswell has become a bit of a tourist site over the years. Growing up in Roswell I always knew of the supposed alien spaceship crash, but no one made anything of it. It definitely didn’t define the town the way it does now. Fast forward a few years and a few alien movies later, Roswell has become the Mecca for all the fanatical alien believers around the world. 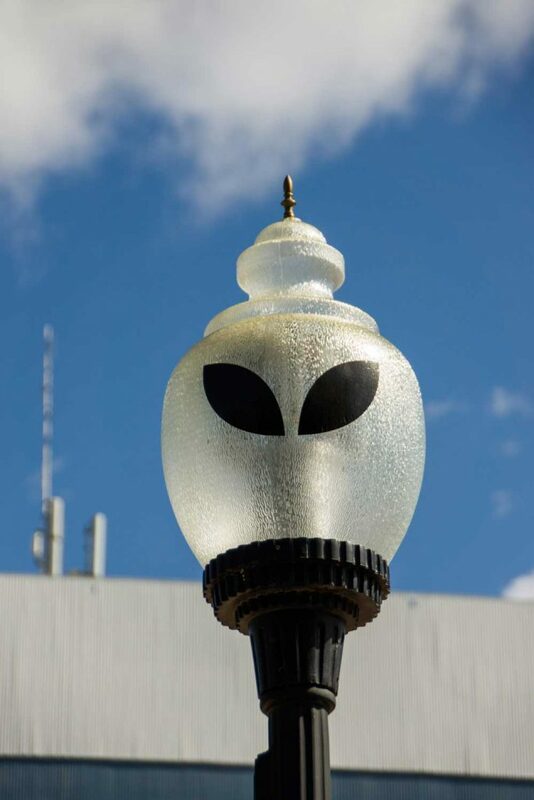 Drive down Main Street in the small town and everything from the local McDonald’s to the street lamps are alien themed. If you plan to visit Roswell, New Mexico take the time to tour the Alien Museum and learn about the history of the town’s mysterious alien sighting. After you’ve visited Roswell and your kids are convinced aliens exist, take them to Bisti / De-Na-Zin Badlands, outside of Farmington, New Mexico. The unique rock formations look other-worldly. 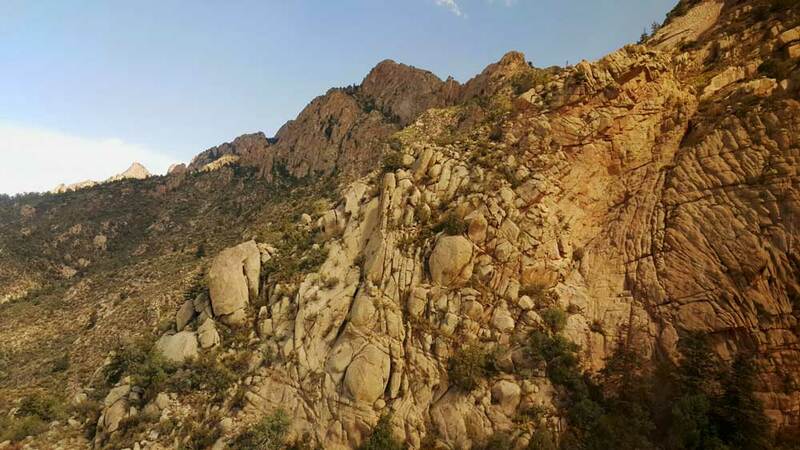 The wilderness area is free to enter and offers some really great and picturesque desert hikes. Beware, there are no marked trails so know where you are going and don’t get lost! 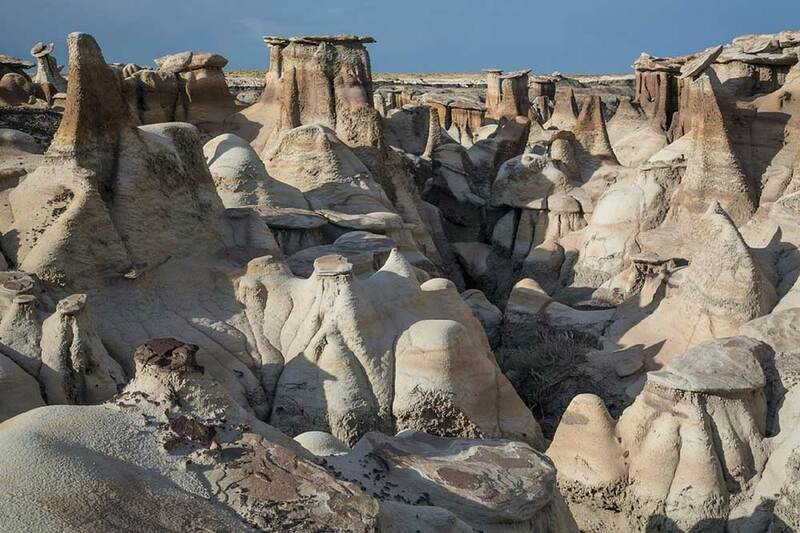 Although the Bisti Badlands are barren grounds now, at one point in time this area was a coastal swamp, which helps explain the unique formations of peaks and valleys. There is no place better than New Mexico in the entire US to learn about the original, indigenous people of the Americas. Native American culture is deeply entwined in the state’s history. At Bandelier National Monument, just outside of the small town of Los Alamos, you’ll find evidence of human settlement that dates back 11,000 years when the Pueblo Indians built cliff dwellings to survive. 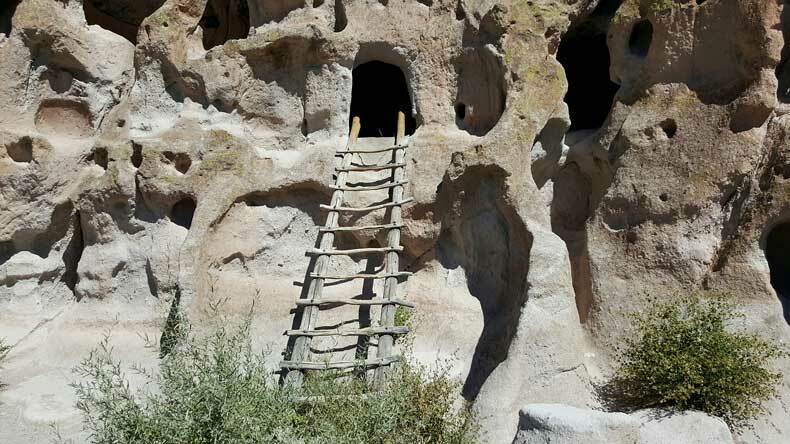 Visitors to Bandelier National Monument can even climb ladders to explore some of the cave-like homes built into the limestone cliffs. I first visited Bandelier National Monument as a child growing up in New Mexico. I was fascinated by the well-preserved glimpse of life long before modern times. Now, as a mother myself, I see this as a valuable place to teach my own child about our country’s history and people. When visiting New Mexico with kids, one of the best things to do is to show them the history and culture that make the state so unique. 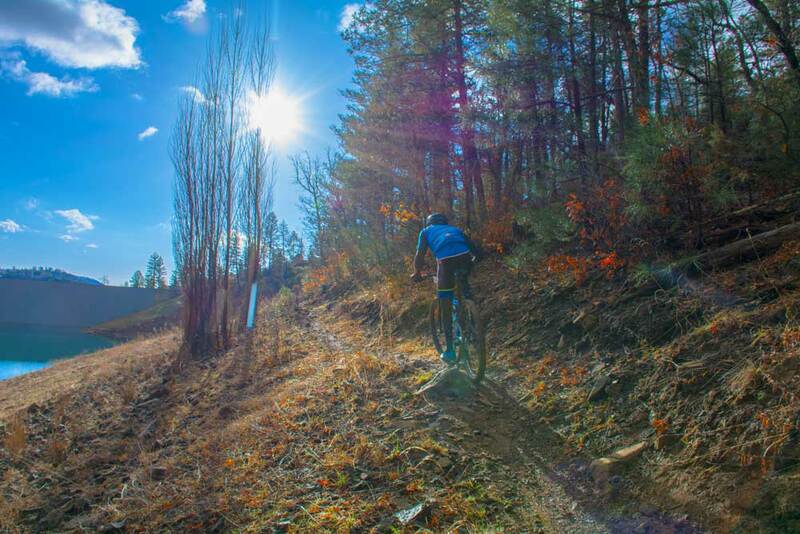 Ruidoso is a picturesque mountain town that you will find to be significantly less crowded than most resort towns. In winter, skiers and snowboarders will enjoy the small but adequate ski mountain, Ski Apache. And in summer, hikers and mountain bikers will find no shortage of trails to explore. In the midtown area, you’ll find unique shops carrying everything from turquoise jewelry to souvenirs and Native American artwork. I spent many summers and winters in Ruidoso as a child and have so many fond memories of this beautiful, small town. Albuquerque is one of the greatest cities in New Mexico to visit with children. I’d recommend spending a few days in Albuquerque with kids. To get a good feel for the city, start out with a visit to Old Town. 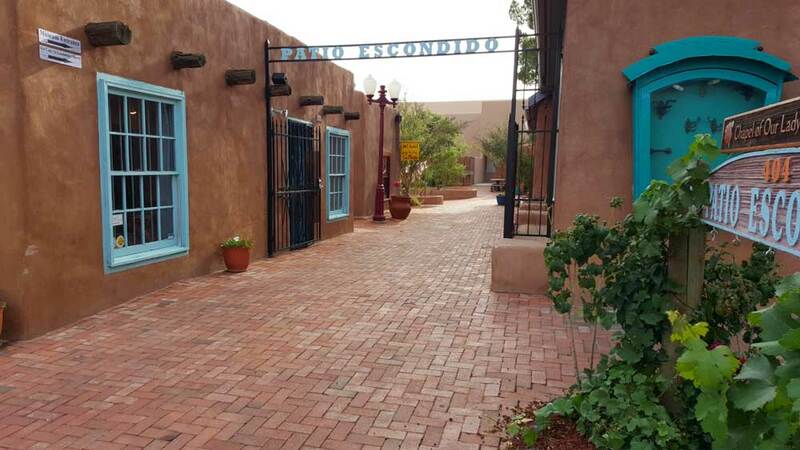 This historic area of Albuquerque features narrow streets lined with adobe buildings. A variety of great shops and cafes run by local artisans and restaurateurs make Old Town a great place to shop local and support small businesses. There are plenty of things to do in Albuquerque with kids to keep the family entertained for a few days. Kids will love the BioPark zoo and aquarium, the Natural History Museum, and Explora Science Museum. All of these are within a short drive from Old Town. Just outside of Albuquerque, a trip up the scenic Sandia Peak Tramway is a must. The longest tramway in the United States, the Sandia Peak Tramway runs 2.7 miles and takes roughly 10-15 minutes to get to the top. The views from inside the tram, as well as from the top of the mountain range are beautiful. Enjoy a nice lunch at the top, or simply hike around and explore on a nice day. A trip to New Mexico with kids wouldn’t be complete without visiting the state capital of Santa Fe. Santa Fe gives you a true sense for the state. The former Spanish settlement maintains much of its original charm and history, while also embodying a quirky artist vibe. 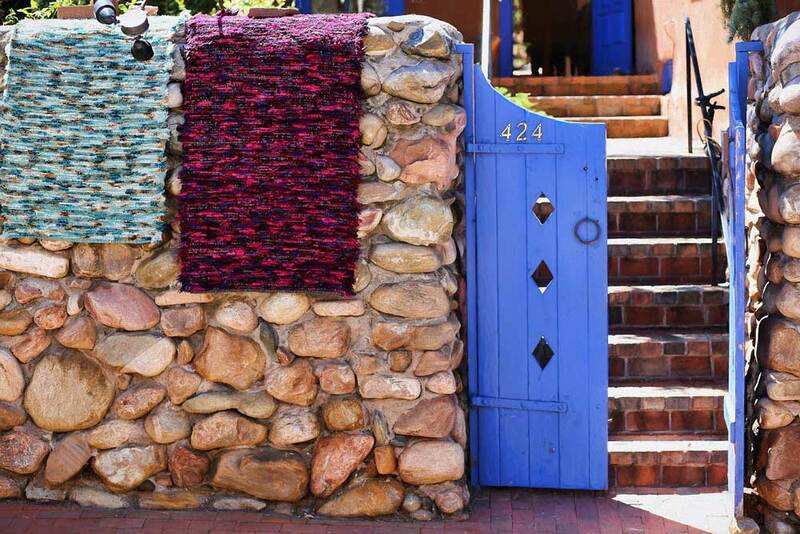 As a first-time visitor to Santa Fe, you’ll want to head to the plaza and walk through the surrounding streets. Take time to dip into some of the many art galleries in the area, and of course enjoy a traditional New Mexican meal made with hatch green chiles. The Taos Pueblo is commonly believed to be the oldest continuously inhabited community in the United States. The multi-story adobe complex is home to about 150 Pueblo Indians and is considered a UNESCO World Heritage Site. 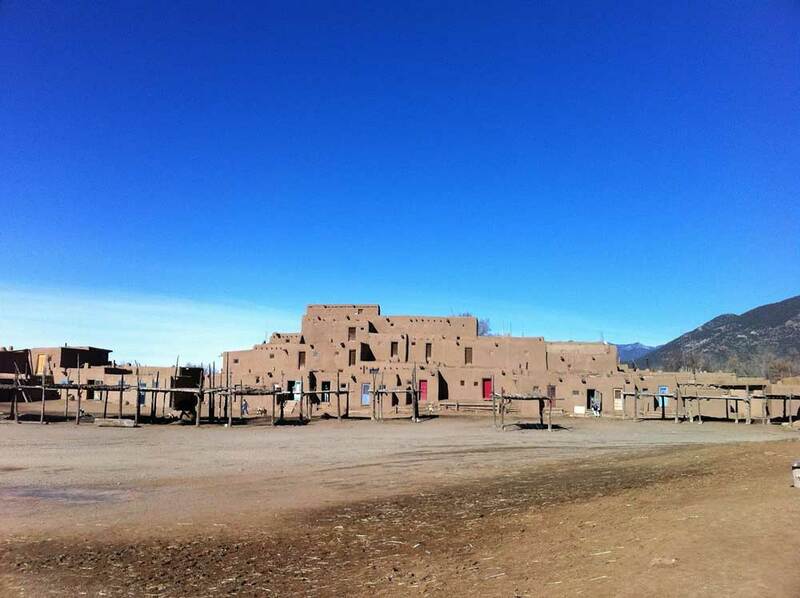 Visitors to the Taos Pueblo can tour the community, learn about life at the Pueblo, and and witness tribal events like ceremonial dances and feasts. New Mexico is a fascinating state for kids. It is a place where they will not only learn about – but learn to love – history, culture, and geography. Exploring New Mexico with kids is a great way for families to turn a road trip into an adventure. From artsy urban areas to barren badlands and even aliens, New Mexico is a must for anyone wanting to experience something different! Have you visited New Mexico with kids – or without? What are your favorite places to visit in New Mexico? Leave your thoughts in the comments below. We were just in Albuquerque/Santa Fe. Meow Wolf in Santa Fe is definitely a plus (and Explora) if visiting with kids. I would definitely skip the natural history museum next time. New Mexico sounds amazing for families. We’ve only visited the Pacific North West Coast of the States but the southern half is on our to-do list and I’d love to add New Mexico to that. It seems there’s a lot on offer for families! I love New Mexico; it truly is a magical place; like most of the Southwest. I still haven’t made it to White Sands NM, but have visited Bandelier, Santa Fe and drove through the Bisti Badlands plenty of times to appreciate their beauty at different times of the day. My favorite place on your list is Taos Pueblo; we’ve toured the village, but there were no ceremonies going on when we were there. We love visiting Chaco; not really a mecca for kids, though ours enjoy it (or so we hope), but I love the remoteness and history there. Born and raised in Albuquerque. I have taken my kids back many times. You hit a lot of highlights. The one thing I would add is the Balloon Fiesta. Definite bucket list item especially with kids! They have such amazement in their eyes as you walk through the balloons. There is no replicating the sights and sounds of the fiesta.